I’ve always liked Cantucci from Prato. When I lived in Florence I remained spellbound in front of the windows of the ovens exposing mountains of freshly baked cantucci. They seemed like the symbol of the city’s wealth. Recently, in an old book of Paolo Petroni “Il tesoro della vera Cucina Toscana” (The Treasury of the True Tuscan Cuisine) – published by Centaur, Florence, I found the recipe that I propose. It is easy and takes little time to prepare. The original recipe calls for white sugar which I replaced with cane sugar. Type 00 flour can be replaced with white spelt flour. 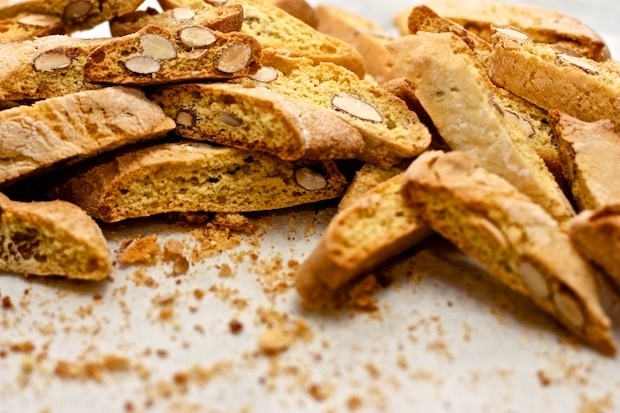 Cantucci are great dipped in Vin Santo dessert wine or a sweet wine. They also make a good breakfast in the morning. Mount well the whole eggs, egg yolks with the sugar, then add the melted butter, the flour, yeast, orange peel, vanilla and a pinch of salt and finally the almonds. Mix quickly with your hands, put a little flour on the table, divide the dough into 5 parts and cut into large loaves two fingers. bake at 300F for 30 minutes. Then remove from the oven and quickly cut the cookies. Put them back in the oven at the same temperature for 10 minutes so they get dry. When they are cooled put them in airtight containers to preserve them.